Fall is definitely here! Here at Inspire Fit Resorts, the air is crisp, the leaves have turned to a rainbow of colors, and we are starting to wear our long forgotten jeans and cozy sweaters. Just because it is getting cooler outdoors doesn’t mean we can’t enjoy everything the fall season has to offer. There are so many activities, outdoors and indoors, that can be enjoyed this time of year. To help you get the most out of your fall season, we have compiled a list of 10 ways to make the most of Fall. Involve yourself in some of them during the next month or two. We promise you won’t regret it! Fall is the prime season for apples. The fruit is packed with anti-oxidants. Anti-oxidants help to repair oxidation damage that affects everyone. Apples are an excellent alternative to coffee, as they are more efficient in waking you up in the morning. They also help with heart health, reduce cholesterol, and help to reduce the risk of cancers. Take your kids to the orchard and pick some apples and enjoy one of the hundreds of ways to prepare them! Click here for 25 apple recipes that are diverse, delicious, and nutritious. Even if you are not a fan of watching football on TV, why not enjoy the sport by playing it yourself? You might be surprised at how much more fun it is when you are the one doing the tackling. Get your family or a group of friends together and hit the park. If tackling isn’t your thing, touch or flag football can be just as fun. The weather outside is cool enough that you won’t get hot and sweaty in the process. Corn mazes are a fun, inexpensive activity that the whole family can enjoy. If you have missed out on your cardio, try checking out a haunted maze. Your heart rate will likely go up when you are sprinting away from the chainsaw man! If scary isn’t your thing, go during the daytime. Most corn mazes offer kid-friendly nights throughout the week that can be just as much fun as the scary version. 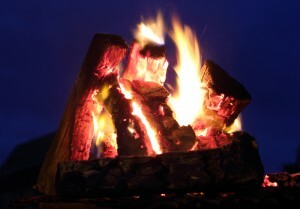 A bonfire may seem like an activity that is more appropriate for the summer season. But it can also be enjoyed during the fall, when you can bundle up in your favorite sweatshirt and sing campfire songs with people that you love. Don’t forget– you can’t have a campfire without S’mores! If milk chocolate and marshmallows don’t fit into your diet, try this super easy Banana S’mores Cookie recipe. With only four ingredients, you can throw them together in a number of minutes. No October is complete without one or two sessions of pumpkin carving! Even when you are an adult, there is something fun about finding the perfect pumpkin, removing the “guts”, and carving in the face of your choice! Not only are carved pumpkins the perfect addition to a fall-themed porch, but pumpkin seeds are a healthy snack that you get as a bonus! Try out this toasted pumpkin seed recipe and you will have a figure friendly snack for the next few days. Haunted houses get more and more popular every year. Chances are you have more than one near you. Get a group of friends together and be a kid again! A little adrenaline pumping through your veins never hurt anyone. Not to mention the calories you could burn running from the scary clown! Don’t let the fall season pass without taking the opportunity to see nature in all its glory. The trees during this time of the year are absolutely stunning in most places. Pack up the car, take a few snacks, and drive somewhere that is removed from all the hustle and bustle. A drive is one of the best ways to relax your body as well as your mind. Is it just us, or is there something really great about candles that smell like autumn harvest and room spray that smells like fallen leaves? Take the opportunity to hit the mall and pick up of your favorite items to make your entire house festive for the fall season. Whether it is candles, soaps, lotions, or oils, they can all help you make the most of the fall season. Okay, this may seem a bit silly. But when was the last time you made a pile of leaves and jumped in? We guarantee it will make you feel 20 years younger. If you are too embarrassed to do it on your own, do it with a group of friends or you kids! Bonus: If you get your kids to do it, it’s an easy way to make them rake up the leaves on the lawn! We hope that these 10 activities will help you to make the most out of fall. It’s a beautiful time of year, and we recommend taking every opportunity to enjoy it as much as possible!